When Nora Everett began working for Principal Financial Group 27 years ago, her son was just 2 years old and her daughter was 3 months old. Now, a generation later, her kids are young adults building their own retirement nest eggs, while Everett transitions from leading Principal’s Retirement and Income Solutions business to beginning her own retirement. Everett, who has been president of Retirement and Income Solutions (RIS) and chairman of Principal Funds for the past four years, will retire at the end of March. Succeeding her as president of RIS will be Renee Schaaf, a 39-year veteran of Principal who has led the company’s global financial services business, Principal International, for the past three years. Schaaf, who was hired by Principal right after graduating from Iowa State University, has known Everett for the better part of a quarter-century. The two have recently been working closely together through the leadership succession as Schaaf prepares to begin her new role on March 1. “It’s been a remarkably smooth transition,” Everett said. Principal’s retirement savings business — which accounts for about 40 percent of Principal’s $668 billion of assets under management — has grown significantly over the past four years. Its full-service retirement business serves more than 45,000 employers that are retirement plan sponsors. Principal also serves nearly 5.7 million plan participants, and works with upwards of 20,000 financial advisers across the United States to bring those plans to small and medium-sized employers. As Everett nears retirement, the irony of her transition from retirement industry executive to retiree isn’t lost on her. Accordingly, one of the biggest initiatives for Principal RIS over the past four years has been in building a next-generation customer experience that creates more of a human-centered design by taking advantage of emerging technologies. Additionally, in May 2018 Principal acquired RobustWealth, a financial technology company whose suite of products includes a digital advice platform, goal-based investment tools and efficient client onboarding processes. The partnership provides the New Jersey-based company with Principal’s insight from working with more than 16 million investment customers globally, while giving Principal the ability to better serve its clients with leading digital advisory capabilities. In March, Principal RIS plans to roll out a new mobile app that will allow its 5.7 million plan participants to fully use all the functionality of their mobile devices in conducting transactions and interacting with their retirement accounts, Schaaf said. It uses an advanced technology that Principal International has already adopted in Chile. Schaaf brings a global perspective on retirement with her from her most recent position. Schaaf is equally excited about focusing specifically on helping people convert the retirement savings they’ve accumulated into an income stream that will last for 20 to 30 years or more. 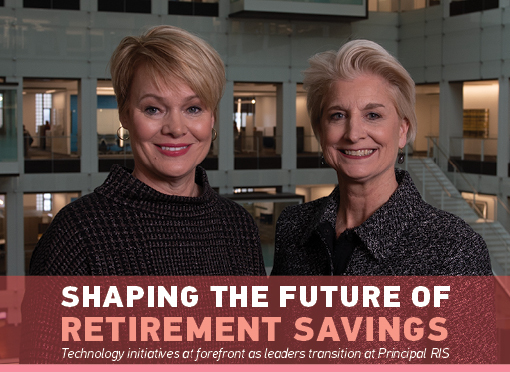 I sat down with Schaaf and Everett together recently at Principal’s downtown Des Moines headquarters to get some insight into the retirement savings world. Here are some highlights from the discussion. How do you describe Retirement and Income Solutions’ role? Everett: If you think about our U.S. retirement businesses, we’re really in two business — we’re in the retirement savings business, and we’re in the retirement income business. And one of the things we’ve rallied around the past few years is a real customer-focused mission. We want to help more people here in the U.S. save enough in their working years, and increasingly important, have enough in their retirement years, which hopefully are going to be very long. Schaaf: So regardless of whether you’re talking about a country in Latin America, Asia or the United States, where Principal comes in is to help millions of people, particularly in the middle class, to save enough and then to have enough in retirement as we change that from asset accumulation into an income stream. Doing that requires that you have a very human design — you put the person you’re trying to serve in the middle of everything you do. And you use technology to help you do that, because the world is changing very rapidly. People really want to conduct business through their phone or mobile device. That doesn’t mean that people aren’t important, and face-to-face help is important if the problem is complex. But we’re seeing a real tendency to want to do business through digital technology. Regardless of the market location, Principal wins when the customer wins. We experience growth in our blocks of business when the persons we serve accumulate enough. So we are definitely aligned to make sure we help that person achieve their retirement goals. Are there some examples of how digital technology is changing how you do this? Everett: One example is a state-of-art onboarding process [developed by Principal]. It’s a digital journey that, one, is really engaging, and, two, doesn’t overcomplicate the process, and three, allows the individual — think of a 21-year-old enrolling in a 401(k) for the first time — to get the best results possible. We call it the onboarding journey, and it’s something we made a significant investment in and have just launched it in the last couple of quarters. The other thing we’ve been able to do is wrap technology around that journey, so we can watch in real time where we need to improve, where we need to tweak the process where maybe people are getting stuck. So that gives us the ability to be very agile in how we evolve that journey. Also, we’re the very first in our industry to roll out chat for our plan sponsors, so as they’re working in their normal day-to-day business, that human resources contact has a chat tool where they can connect directly with us. The efficiency and simplicity of that have been really huge gains for them and for us. What’s the significance of Principal’s partnership and acquisition of RobustWealth? Everett: They have a digital platform and have the ability to give self-directed investment advice. So by partnering with them, we are working to bring that capability not just to individual investors who come to us directly but also we’re going to be rolling that out to our 401(k) platform. It’s another way to look at using technology to enable those folks who want to be self-directed to have a digital platform to do that. How much is the do-it-yourself investor niche growing? Everett: I still believe the vast majority of 401(k) [plan participants] are going to want and are best off with a do-it-for-me solution. The beauty of RobustWealth, however, is that the asset allocation piece of that is a do-it-for-me [platform]. So even though they’re self-directed when they go into that platform, what you have behind it is a very effective target date fund. And having that fully diversified solution that you default folks into through the plan design … [with auto-enroll, auto-escalate and a fully diversified fund] is still going to be the magic behind having not just a really effective plan but also effective outcomes for your employees. Is auto-enrollment improving participation results? Everett: Yes. When we work with employers or advisers to get that best-practice plan design in place, we absolutely see better outcomes. [Auto-enrollment plans usually start with a deferral of 6 percent that auto-escalates each year until it reaches a percent salary deferral.] Less than 10 percent of these millions of folks actually opt back out, because they know it’s in their best interest. So that plan design is really powerful. Initially, plan sponsors were concerned that employees would be upset or frustrated that they were opted in. They’re finding exactly the opposite, that people are very appreciative that happened earlier in their career rather than later. What’s the outlook for guaranteed income products like annuities? Schaaf: Annuities are certainly one of the ways we can work with people to provide that income stream and to provide guarantees around it. But when we look at the full spectrum of solutions, mutual funds and even some liquidity within bank accounts come into play. What you’re really trying to do is provide a programmed withdrawal. … It has to be a blend, but annuities will play a very important role. Everett: We were one of the first to market in the U.S. with a guaranteed income solution that’s part of a 401(k) lineup [Principal Pension Builder]. Anyone can take advantage of it, but it gives people [over 50] a unique chance to take chips off the table from the equity market and buying at group pricing a deferred guaranteed income for when they retire. So it’s an interesting way to give someone access to a guaranteed income solution as part of their 401(k). How well is that product doing? Everett: We’ve had many plan sponsors interested in it. There are two things we’re working on — there is still some complexity there, so we’re working on making sure we simplify that for plan participants. Also, from a regulatory standpoint there’s still work to be done around portability, and we’re actually working on that in Washington right now. There is some bipartisan support for some legislation in Congress that recognizes the importance of guaranteed lifetime income and addresses several of these challenges. Schaaf: We must continue to be an active voice in shaping retirement public policy. Nora has been an exceptional leader in making sure Principal’s voice was heard in industry organizations and on the Hill. That has to continue, whether I take the same visible roles that Nora had or I work more behind the scenes. I think that’s an important role and needs to be continued. Nora is a remarkable leader in many respects. One of the things that’s important is that she is a female leader who’s at the top of the game in the business, but she started as a lawyer and made that transition, and I think that’s remarkable. I think her attention to diversity, the importance of having female leadership at the table, has really lit a path for many women.